Medium: original etching. Printed in 1946 on BFK Rives wove paper on Daragnes' own press. Published in a limited edition of 300 for "Alternance" (an art and literary project featuring writers Paul Eluard, Pierre Mac Orlan, Ribemont-Dessaignes, et al., along with original prints by artists Jean Cocteau, Henri Matisse, Jean Laboureur, Edouard Goerg, Marie Laurencin, André Lhote, Valentine Hugo, Henri de Waroquier, Dignimont and Jacques Villon). These important cultural figures collaborated together just after the end of the Second World War. Plate size: 11 1/2 x 7 1/2 inches (295 x 193 mm). Signed in the plate (not by hand). A very rich impression with exquisite color! Condition: there is a small stain in the bottom margin. 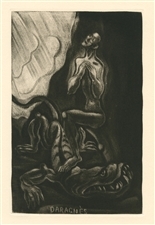 Medium: original etching and aquatint. Executed in 1945 and from the edition of 1000 on Velin de Lana cream wove paper, this piece is now quite scarce. Contributed by Daragnes for the book "Jours de gloire", a compilation of stories about the Liberation of France, and issued as a loose insert for the frontispiece. The plate measures 7 1/4 x 4 3/4 inches (185 x 120mm). Signed in the plate (not by hand). In fine condition with full original margins.